WARNING: Patients have benefited from use of pimecrolimus when it is used correctly. Long-term safety for this drug is not known at this time. There have been rare reports of cancers (e.g., skin cancer, lymphoma) in patients using pimecrolimus. It is not known whether pimecrolimus caused these cancers when used on the skin. Further studies to determine the long-term safety of this product are ongoing. In the unlikely event that unusual lumps, swollen glands, or growths (especially on the skin) occur, contact your doctor immediately. The FDA recommends the following: This drug should be used only if other drugs have failed or if other medications are not considered appropriate by your doctor. Pimecrolimus should be used on the skin for short treatment periods only. If needed, treatment may be repeated with breaks in between. 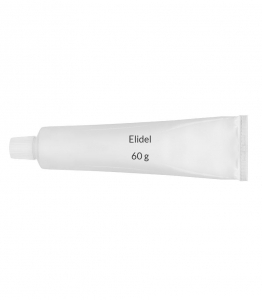 Use the smallest amount that will treat your condition properly, and apply only on the affected skin. Also, this medication should not be used in children younger than 2 years. As with all medications, discuss the risks, benefits, and proper use of this medication with your doctor. USES: Pimecrolimus is used to treat certain skin conditions such as eczema (atopic dermatitis) in people who should not use or have not responded to other eczema medications (e.g., topical steroids). Eczema is an allergic-type condition that causes red, irritated, and itchy skin. This drug works by changing the skin's defense (immune) system, thereby decreasing the allergic reaction that causes eczema. Pimecrolimus belongs to a class of drugs known as topical calcineurin inhibitors (TCIs). This medication is not recommended if you have a history of a certain rare genetic disorder (Netherton's syndrome). Also, this medication should not be used by anyone who has a weakened immune system (e.g., following an organ transplant). HOW TO USE: Read the Medication Guide provided by your pharmacist before you start using pimecrolimus and each time you get a refill. If you have any questions regarding the information, consult your doctor or pharmacist. Wash your hands with soap and water before using this medication. Apply a thin layer to the affected areas of skin, usually twice daily or as directed by your doctor. Rub the medication into the skin gently and completely. Wash your hands after using this product unless your hands are being treated. If your doctor recommends a moisturizer, apply it after this medication. Pimecrolimus is for use on the skin only. Avoid getting this medication in your eyes or on the inside of your nose or mouth. Do not apply this medication to open wounds or infected areas. Do not cover the treated area with plastic or waterproof bandages unless directed to do so by your doctor. Do not bathe, shower or swim right after applying this medication. Use this medication exactly as directed. Your doctor may instruct you to stop using it once your eczema has cleared up and to start using it again if signs or symptoms reappear. Consult your doctor for details. Inform your doctor if your condition does not improve after 6 weeks of using this medication or if your condition worsens at any time. SIDE EFFECTS: Mild burning or irritation at the application site may occur during the first few days of treatment. Headache may also occur. If any of these effects persist or worsen, notify your doctor or pharmacist promptly. Remember that your doctor has prescribed this medication because he or she has judged that the benefit to you is greater than the risk of side effects. Many people using this medication do not have serious side effects. Tell your doctor immediately if the following unlikely but serious side effects occur: signs of infection (e.g., fever, persistent sore throat). A very serious allergic reaction to this drug is rare. However, seek immediate medical attention if you notice any of the following symptoms: rash, itching/swelling (especially of the face/tongue/throat), severe dizziness, trouble breathing. This is not a complete list of possible side effects. If you notice other effects not listed above, contact your doctor or pharmacist. In the US - Call your doctor for medical advice about side effects. You may report side effects to FDA at 1-800-FDA-1088. In Canada - Call your doctor for medical advice about side effects. You may report side effects to Health Canada at 1-866-234-2345. PRECAUTIONS: Before using pimecrolimus, tell your doctor or pharmacist if you are allergic to it; or if you have any other allergies. This product may contain inactive ingredients, which can cause allergic reactions or other problems. Talk to your pharmacist for more details. Before using this medication, tell your doctor or pharmacist your medical history, especially of: current infections (e.g., mononucleosis), use of light therapy (e.g., UVA or UVB), skin infections (e.g., herpes, chickenpox, shingles, warts), immune system problems. This medication may make you more sensitive to the sun. Avoid prolonged sun exposure, tanning booths and sunlamps. Use a sunscreen and wear protective clothing when outdoors. This medication should be used only when clearly needed during pregnancy. Discuss the risks and benefits with your doctor. It is unknown if this medication passes into breast milk. Consult your doctor before breast-feeding. DRUG INTERACTIONS: Your healthcare professionals (e.g., doctor or pharmacist) may already be aware of any possible drug interactions and may be monitoring you for them. Do not start, stop or change the dosage of any medicine before checking with them first. Before using this medication, tell your doctor or pharmacist of all prescription and nonprescription/herbal products you may use, especially: topical steroids, other ointments/lotions/creams. This document does not contain all possible interactions. Therefore, before using this product, tell your doctor or pharmacist of all the products you use. Keep a list of all your medications with you, and share the list with your doctor and pharmacist. NOTES: Do not share this medication with others. This drug should be used as directed for treating your current condition only. Do not use it later for another condition unless told to do so by your doctor. A different medication may be necessary in that case. Keep all medical appointments while you are using this medication. MISSED DOSE: If you miss a dose, use it as soon as you remember. If it is near the time of the next dose, skip the missed dose and resume your usual application schedule. STORAGE: Store at room temperature between 59-86 degrees F (15-30 degrees C) away from light and moisture. Do not freeze. Make sure the cap on the tube is tightly closed. Keep all medicines away from children and pets. Do not flush medications down the toilet or pour them into a drain unless instructed to do so. Properly discard this product when it is expired or no longer needed. Consult your pharmacist or local waste disposal company for more details about how to safely discard your product.